The visibility of safe stairs is critical to ensure that a person can prepare to coordinate their gait during stair ascent and decent. For people with ‘normal’ vision this relies on visual clues such as handrails, depth perception in good lighting conditions and high visibility of step nosings. Poor delineation of the step edge may confuse people negotiating the stairs, particularly in poor lighting conditions thus increasing the risk of a miss step. Best practice is to set slip resistive strips with a luminance contrast greater than 30% to the very edge of the stairs. The width of the strips should be between 50-75mm, this assists persons to negotiate the stairs by clearly delineating the step edge, thus minimising the risk of a miss-step on the stairs. This is increasingly important when people’s eyes require time to adapt to lower lighting conditions. To highlight best practice, these safe stair features are required for disability access requirements within AS 1428.1, Design for Access and Mobility; Part 1: General requirements for access – Buildings. The slip resistance for stairs in terms of the Required Coefficient of Friction (RCOF) during moderately paced stair descent is comparable to that found during over ground walking . It has been found that the RCOF of safe stair descent during weight acceptance is approximately 0.26 . Thus in the absence of contaminants on the stair tread, frictional factors play a minor role in stair safety during descent for internal stairs that are maintained in a clean and dry condition, unless subjects wear poor footwear, resulting in low coefficients of friction. 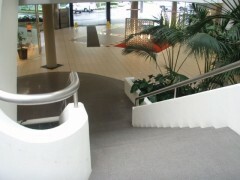 For external stairs and transitional areas in entrances, the slip resistance can be a significant factor and stair treads should achieve Pendulum Class W for public areas where water contamination is likely, when tested to AS/NZS 4586, Slip Resistance Classification of Pedestrian Surface Materials. Any slip resistant strips must be installed to the edge of the nosing as when a person descends a flight of stairs, with an approximate going of 250mm, the foot tends to make contact within 5 mm from the step edge. The provision of handrails provides a visual clue that there are steps present to negotiate. Handrails reduce the risk of a miss-step by increasing postural stability and assisting as a fall restraint. The Building Code of Australia (BCA) provides limited prescriptive requirements on handrail design. Besides the handrail height above the step best practice is for the railing is to be semicircular, with not less than 30 mm or more than 50 mm diameter for not less than 270º around the upper surface that does not tend to break a handhold. This handrail arrangement provides a power grip, which encompasses the majority of the handrail assisting fall arrest, rather than a relying on a pinch grip. The dimensional geometry of stairs should establish a suitable gait pattern that is consistent throughout the flight of stairs. For commercial premises the BCA requirements are that dimensions of stair risers be between 115 – 190 mm and stair goings between 250 – 355 mm. An attempt should be made for stair goings to be greater than 300 mm as the risk of over stepping over the edge of the stair is significantly reduced. The stair going to riser ratio (2R + G) within the range of 550 – 700 assists to promote a suitable gait pattern. Dimensional inconsistency of stair going and risers can have a tremendous impact on a persons gait and balance, and are generally not visually obvious. Stairs with an irregularity as little as 6 mm between adjacent rise and runs can disrupt foot movements enough to cause a fall. A person has an expectation of a certain distance at which to place their foot at each step. If their expectation is not met, a fall can result from a misstep. This most often occurs when the stair going dimensions are reduced significantly near the bottom of stairs when the pedestrian has built a degree of confidence of where the next step will be to ensure proper safe foot placement.